The [Kolkata-class’] armament consists of a 76 mm Super Rapid Gun Mount, a fully-automated Russian AK-630 close-in weapon system, and RBU-6000 rocket launchers, as well as indigenous twin-tube torpedo launchers. The vessel also can carry up to 32 Barak-8/NGs — an Indo-Israeli surface-to-air missile (SAM) jointly developed by Rafael-IAI and India’s Defense Research and Development Organization (DRDO). Furthermore, the vessel sports a vertical launch missile system for long-distance engagement of shore and sea-based targets. The INS Kochi’s principal anti-ship weapon is the BrahMos surface-to-surface supersonic cruise missile, which boasts an operating range of 290 km and was co-developed by the DRDO and the Russian defense industry. The destroyer carries the Elbit Systems Deseaver MK-II decoy control and launching system to provide protection against anti-ship missiles. The ship’s Multi-Function Surveillance Threat Alert Radar (MF-STAR) is the Israeli equivalent to the U.S. Navy’s Aegis Combat System and allegedly on par with the Chinese “Aegis” system installed on the Type 052D Multirole Destroyer. 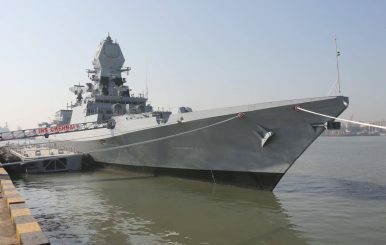 In addition, “the ship is designed to carry and operate up to two multi-role combat helicopters,” according to Vice Admiral Girish Luthra, the head of the Indian Navy’s Western Command. Moreover, “the ship is equipped to fight under Nuclear, Biological and Chemical (NBC) warfare conditions,” the MoD press release notes. After the completion of further sea and weapons trials, INS Chennai will be assigned to India’s Western Fleet and permanently based in Mumbai. The lead ship of the Kolkata-class, the INS Kolkata, was commissioned back in August 2014 after a four-year delay. The second ship of the class, the INS Kochi, was commissioned in October 2015. According to the Parrikar, the “roadmap for the navy’s expansion and growth would continue to remain firmly anchored on self-reliance and indigenization.” Around 60 percent of the ships’ components are made in India. The Indian Navy plans to field 200 warships by 2027.